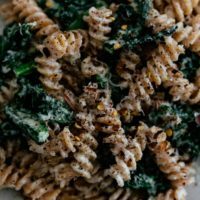 Lentil Rotini with Garlicky Kale and Goat Cheese Sauce | Naturally.Lentil Rotini with Garlicky Kale and Goat Cheese Sauce | Naturally. Heat a large skillet over medium-low heat. Add the ghee followed by the kale. Let cool, stirring occasionally, until the kale is starting to wilt. Stir in the minced garlic and a pinch of salt. Let cook for another minute or two, until the garlic is golden and the kale has softened. To make the pasta, bring a pot of salted water to a boil. Add the Red Lentil Rotini and cook until al dente, 7 to 8 minutes. Drain and return the pasta back to the pot. Finally, in a blender, combine the goat cheese, milk, parmesan, salt, and pepper. Puree until smooth, adding a splash more milk if needed to thin the sauce. Combine the kale with the pasta and the goat cheese sauce. Toss until well combined and serve, with a sprinkle of crushed red pepper, while still warm. Leftover pasta will need a little more liquid as it reheats- the sauce really soaks up into the pasta.